A very attractive, Victorian, pine front door with attractive arched panels. The door is very well made and is mortised and tenoned. 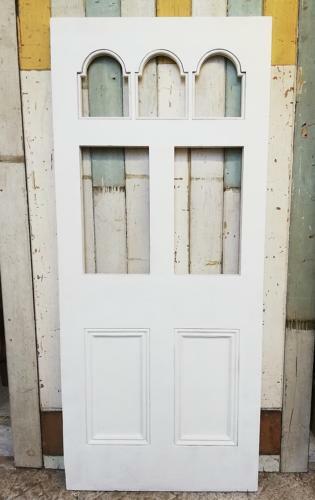 The door has been patch repaired and has been primed and undercoated, ready for finish by purchaser. The door has mouldings around the base panels and the top arched panels. The door has two large rectangular panels and three small arched panels, ready for glazing. We can glazed the door for AN EXTRA CHARGE, please contact us to discuss your requirements and for a quote. The door requires hardware, to be supplied by purchaser. The door has some very slight signs of wear due to age. There are some slight knocks and chips and a very slight knock to the base edge of one side. We have made the important curved beading for the upper panels but the middle panels are missing their beading. The beading required is parting bead and this can be supplied by Richard Burbidge, code number FB361. The door is a wonderful example of Victorian design and would make a fantastic feature within a home.